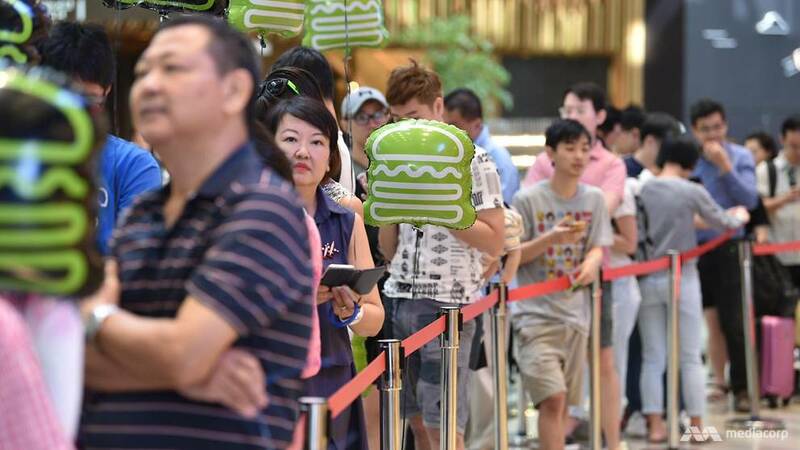 SINGAPORE: At 11:00 on Wednesday (April 17), the official opening day of Jewel Changi Airport, the line outside Shake Shack had grown so long that it swung around an atrium, divided into four barricaded sections. Signs were parked in line to inform more than 200 customers that they could buy up to five burgers and flat dogs per order at the first branch of the American hamburger chain in Southeast Asia. First in line were customers Justin Zheng and Hiroki, who only wanted to be known by his first name. They told CNA that they had been queuing that morning since 4.30 a.m.
"We are Kiasu-Singaporean," said Mr. Zheng. "First day, first opening, first Shake Shack – kiasu Singaporeans." Unlike Shake Shack, which was opened for the first time on Wednesday at 10:00, A & W was even open during Jewel's preview period. It was reported that customers spent an average of three hours in line for their food. Around Wednesday at 11 a.m., more than 50 people stood in line at the fast food restaurant – A & W & # 39; s first in Singapore in more than a decade. One customer, who refused to be named, said she had been waiting since 7:45 am because she thought A&W would be open 24 hours. "I feel like they should have told customers they would open at 10 am, then we would have come at the right time," she said. She told CNA that she visited Jewel during the preview period, but was unable to buy from A & W due to the long queues. People were not alone in line for food. A visitor, 26-year-old freelance photographer Neo Wei Xiong, told CNA that he was in line for the Pokemon Center from about eleven o'clock on Tuesday evening. "It's the first time that the Pokemon Center will be in Singapore and I want to see the item exclusively for Singapore," he said, adding that he had failed to access the Jewel preview. The Pokemon fan said he had spent most of Tuesday night outside of Jewel, as customers were allowed to be alone in the mall at 6 AM. Earlier that morning, most visitors were busy near the HSBC Rain Vortex, & # 39; the world's highest indoor waterfall. Two of them, Mrs. Cynthia Winna Widya Putri and Mrs. Yenita Shanty Veronika Sianturi, had just flown in from Indonesia. "We wanted to see Jewel because it is the (first day of opening) and we are so excited," Mrs. Putri said.